WinUSB is a tool that lets you create a Windows USB install stick from Linux in just two clicks. The application supports Windows an Vista and can use either an ISO or a DVD as a source. Update: WinUSB supports Windows 8 as well. A while back we wrote about creating a bootable windows 7 USB drive from Linux using Unetbootin, but newer Unetbootin versions can't do this anymore (you can still use an older version though) and you have to manually format the USB drive to NTFS, which may look a bit complicated for some users. But thanks to WinUSB, this process is now a lot easier! WinUSB comes with both a graphical user interface and a command line tool and in my test, I was able to successfully boot the Windows Seven USB stick created using WinUSB (created under Ubuntu 11.10 Oneiric Ocelot). If you don't want to add the PPA, you can also manually download the .deb from HERE. For Arch Linux users, there's an AUR package available. For source files, see the WinUSB homepage. 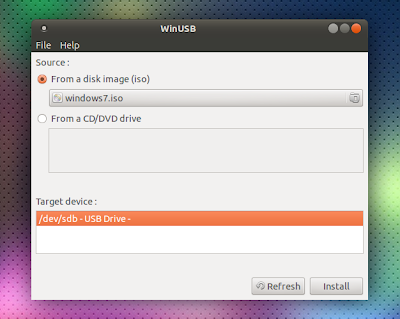 To create a bootable Windows 7, Windows 8 or Vista USB install stick from Linux, make sure you have a large enough USB drive (at least 4 GB), start the WinUSB GUI (just search for WinUSB in the menu / dash), select the Windows 7 / Vista ISO or DVD drive and the target device which is your USB drive, and click "Install". That's all. If for some reason, the USB drive doesn't show up under "Target device" but shows up in your filemanager, etc., you can force WinUSB to list it by selecting File > Show all drives. But make sure you don't select the wrong device (like your hard disk) if you do this!